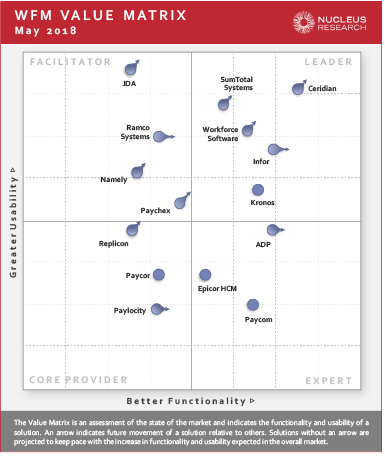 Nucleus Research’s detailed review of each leading workforce management vendor. Workforce management is the epicenter of HCM, where functionality for the essentials of employing people resides: payroll, core HR, time and attendance, scheduling, and benefits administration (Nucleus Research r97 – Value in HCM ripples from the epicenter outward, May 2017). This is arguably the most important area of the enterprise to get right. Every workforce management solution is different. This report will breakdown those differences clearly, giving you the high-level information you need to make the right decision for your company, people, and future. Download this complimentary report by filling out the form on this page. Download Nucleus Research’s WFM Technology Value Matrix 2018. This report provides a detailed review of each leading workforce management vendor.